On 4 August 2018, an impressive collection of foals will go under the hammer at the third edition of the EDS auction, with support from the KWPN. The auction organizers have selected 27 foals, each boasting bloodlines with abundant sport talent. Heading the unique cooperation between the KWPN and the EDS organization are Nico Witte, Joop van Uytert, Joep Schellekens, Eugène Reesink and Tim Coomans, who ensured a very successful auction last year, with an average selling price of € 14,700 per foal. This year again, the auction will be held in conjunction with the World Dressage Breeding Championships for Young Horses, which run from 2 – 5 August 2018 in Ermelo. Due to great demand from international buyers for foals with interesting bloodlines, the organization has changed the concept of the auction. In past years, the auction included riding horses; this year, however, the auction is dedicated exclusively to foals, each of which meets the demand for interesting bloodlines. For instance, three foals in this auction are represented by the stallion In Style, who is qualified for the five-year-old division of the World Dressage Breeding Championships for Young Horses. 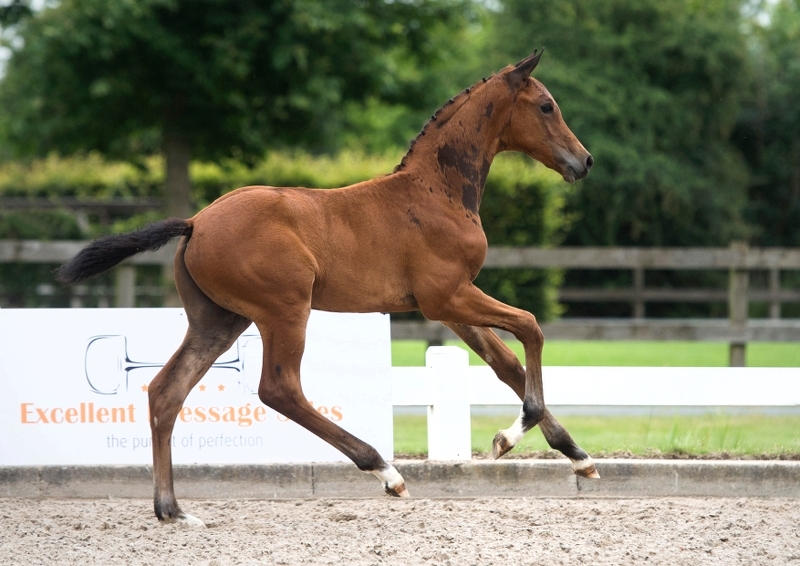 These foals set themselves apart with movement that has reach, scope and elasticity. Featuring four foals, the performance test champion Just Wimphof is the top sire of this auction. The youngest of his foals offered is Nurona, who is out of a full-sister to the stallion Blue Hors First Choice. Notably, Nurona’s granddam Vurona is also the dam of the stallion High Five U.S. and the granddam of Knock Out (s.Ebony), the top horse of the KWPN spring performance test. View collection of EDS-KWPN 2018.